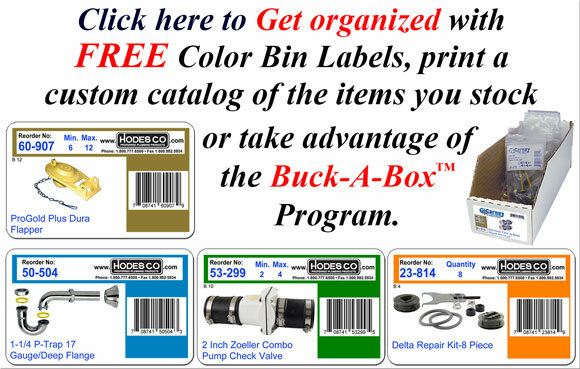 truck stock organizer box kits. Click here to read Lanz Heating, Cooling and Plumbing's Stock Service System story. Time and Material Catalogs Now Available. $11.13 each on orders under $500 or on orders over $500 pay $9.79 Each. 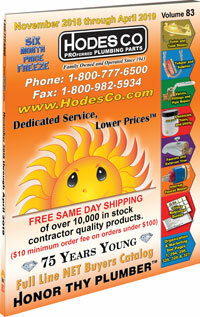 Hodes Company is a wholesale plumbing parts and plumbing supply distributor. We stock over 10,000 high quality plumbing parts and plumbing supplies. We ship anywhere in the contiguous United States free of charge via UPS Ground. We do have a minimum order fee of $10 but that is waived on all orders over $100. We stock full lines of fittings including Copper fittings, SharkBite, Speedfit, DWV, compression, brass, malleable, PVC and CPVC. We also carry full lines of tubular, supply stops, ball valves, hydrants, chemicals, tools, faucets, commercial drains, water filtration, disposers, aerators, shower heads, rebuild kits, tub spouts, replacement handles, stems, cartridges, faucet repair kits... Basically we carry every repair part and plumbing supply imaginable. If you don't see it, just ask and if it makes sense we will add it to our extensive line of high quality plumbing repair parts and supplies. There is a difference!